When I first heard of Well Scent, I was immediately intrigued by what they do. Well Scent is a line of handcrafted, cruelty-free, vegan, and completely natural products. Their goal is to create natural alternatives to products that are often loaded with chemicals and other nasty ingredients. All of the blends are completely unique to Well Scent. 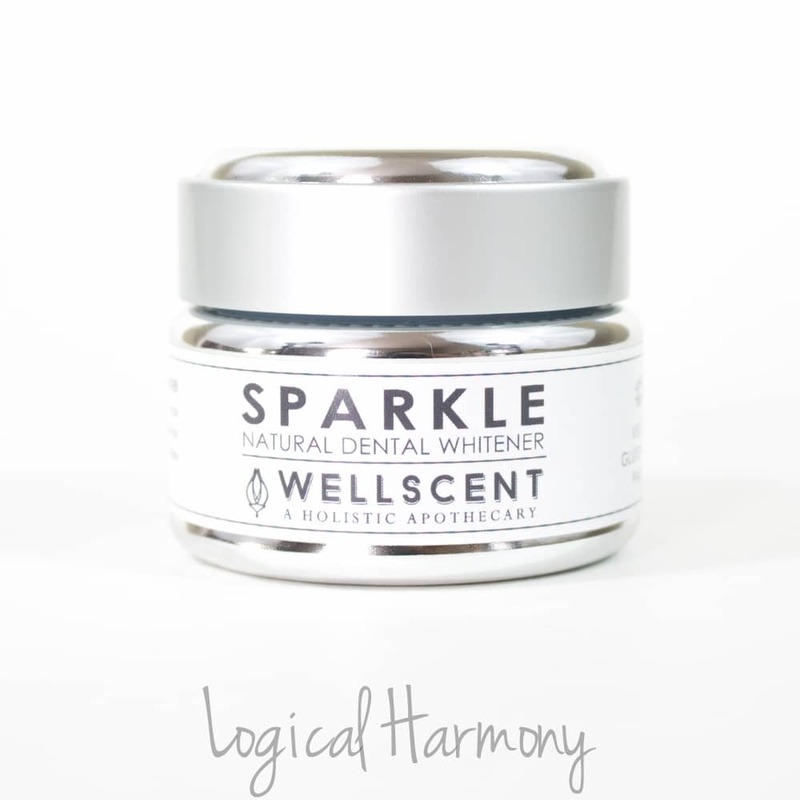 For a long time, I have been trying to find good cruelty free and vegan alternatives for dental products that were also more natural, so partnering with Well Scent to tell you more about their natural dental line seemed like a perfect fit! 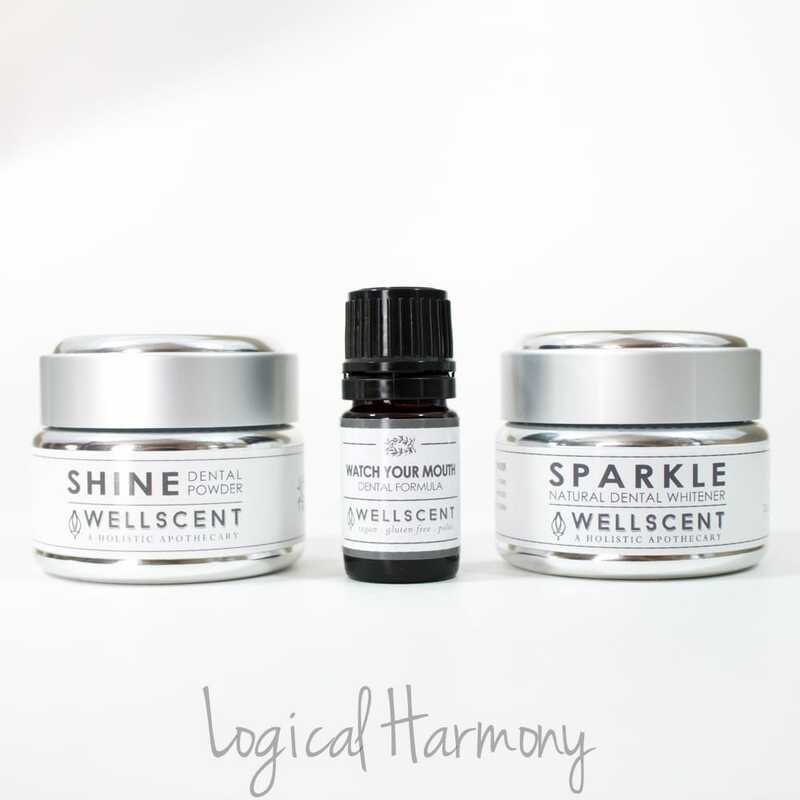 I received three products from the Well Scent dental line to try and review – Sparkle, a natural teeth whitening treatment, Shine, a mineral rich brightener and polisher, and Watch Your Mouth, a toothpaste alternative and mouthwash. I couldn’t wait to give them a try and incorporated these products into my daily dental hygiene routine immediately. 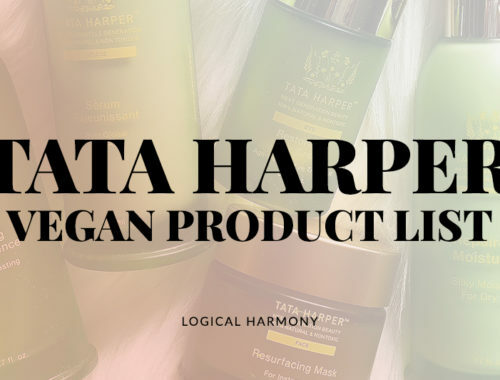 Read more to hear my thoughts about each product and the line as a whole. 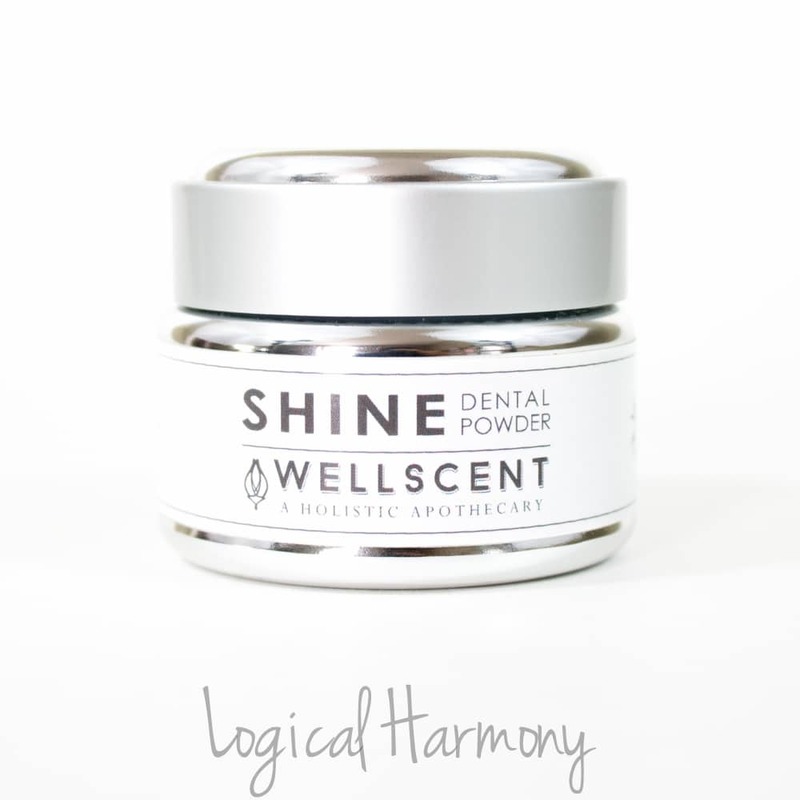 Continue reading the Well Scent Dental Health Line Review! The first product from the Well Scent dental line that I used was Sparkle. Sparkle is described as “a natural and systemically supportive alternative to toxic mainstream teeth whitening treatments. Rather than adding to the body’s toxic burden while whitening your smile, Sparkle utilizes earth’s gifts to detox the mouth, eliminate plaque and naturally brighten and strengthen dental enamel.” Who doesn’t love the idea of whiter teeth and a healthy mouth without all the toxins? To use Sparkle, you brush for 2 minutes once a day for 7-10 days. I have to admit that the first time I used Sparkle I was shocked at how it looked! Keep in mind that it contains activated charcoal – so your mouth will be shades of black and grey while you brush. You will want to rinse your mouth well after brushing. This was a bit scary looking at first, but I weirdly found it fun after the first use! I used Sparkle as instructed, by sprinkling a pinch onto a wet toothbrush and brushing for 2 minutes. I did this once a day for 7 days. After the first use, I could see that my teeth were definitely brighter. By the 3rd day, my teeth were visibly whiter to other people. I drink tea and coffee daily so I like to do what I can to keep my teeth white. I felt that Sparkle whitened my teeth by at least one shade and brightened the appearance of my teeth as well. The results of Sparkle were so great that it has earned a permanent place in my dental hygiene rotation. If you are looking for a natural and effective way to whiten your teeth, Sparkle is a great option that I definitely recommend. After using Sparkle, I wanted to make sure my teeth stayed bright and sparkling by using Shine. 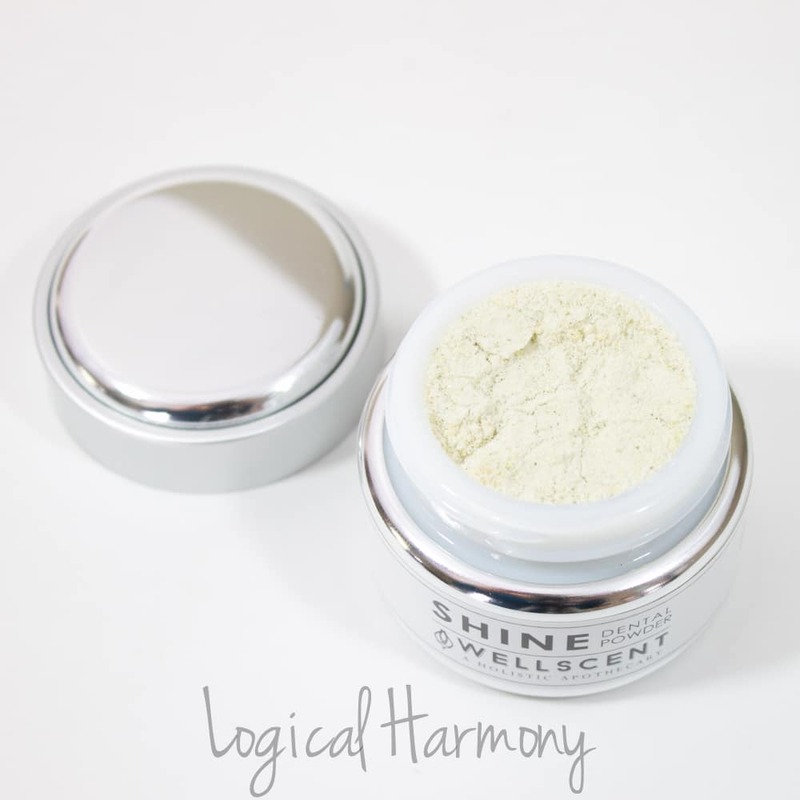 Shine is described as an “exfoliant, tooth brightener and polish that supports locally and systemically. The natural ingredients are transported directly into the bloodstream from the gum mucosa. This formulation strongly inhibits the bacteria that cause heart disease, gingivitis, bad breath and inflammation from other microbes. It has received praise amongst medical and naturopathic doctors as well as biological dentists.” You don’t usually see such wonderful benefits from a product with such natural ingredients, so I was eager to see how Shine worked. I used Shine in combination with Watch Your Mouth. First I added 1-2 drops of Watch Your Mouth to a dry toothbrush, then a pinch of Shine and brushed thoroughly. I have to say that I found the formula really effective. My teeth felt incredibly clean, and my entire mouth simply felt cleaner. I have used toothpastes in the past that made my teeth feel cleaner, but Shine actually made my gums feel cleaner as well. Using Shine really helped to maintain the bright and white teeth I got from using Sparkle. This is a great option for everyday use. If you are looking for a natural alternative to traditional toothpaste, this is a great option and one that I highly recommend. As I mentioned above, I used Watch Your Mouth with the Shine dental powder. 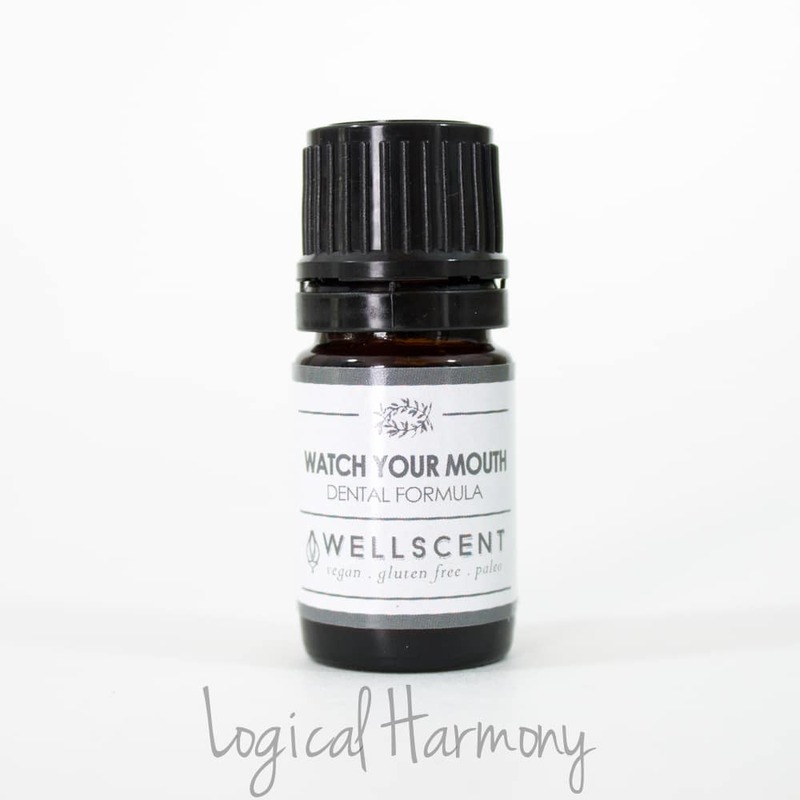 Watch Your Mouth is Well Scent’s “Proprietary Blend of Pure, Therapeutic, Organic and/or Wild Crafted Essential Oils that are clinically proven to significantly reduce the bacteria that cause bad breath, cavities and heart disease.” It’s way stronger than toothpaste, so a little bit goes a very long way. Plus, it’s anti-fungal, anti-viral, and antibacterial. Watch Your Mouth has a pleasantly unique taste and feeling. When I used it, my mouth felt warm and fresh. I feel like this alone gave my gums an even cleaner feeling than other products have. It made my gums feel great. To me, it seems like the unique blend of oils in Watch Your Mouth have some anti-inflammatory properties. I actually burned my mouth sipping some hot tea and while brushing my teeth later that night, my mouth and gums felt soothed after using this blend of oils and it really helped to relieve the uncomfortable feeling from the burn. Sometimes I used a drop during the day to keep my breath fresh, and it worked incredibly well. Instead of just covering the scent of onions in my salad, like a breath mint would, it seemed to completely eliminate it all together. For those who tend to use mouthwash or mints often, this would be a great product to keep in your purse or on your desk. Well Scent also suggests adding 1-3 drops into an oil pulling routine, which is what I want to try using this in next. I’m really grateful to have had the chance to try out the products from the Well Scent dental line. I was really impressed with everything. This was my first experience with a natural dental line of this kind, so I wasn’t too sure what to expect. All of the products worked really well on their own, and together. 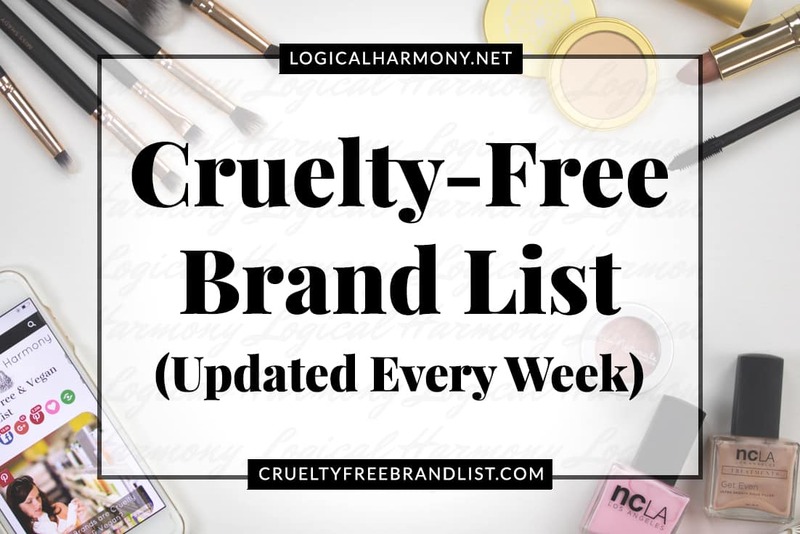 I am definitely going to continue to use these Well Scent products and would suggest them to anyone looking to brighten their smile and bring more natural, cruelty free, and vegan products into their dental hygiene routine. You can stay up to date with Well Scent by visiting their website and by following them on Facebook, Twitter, Pinterest, and Instagram. 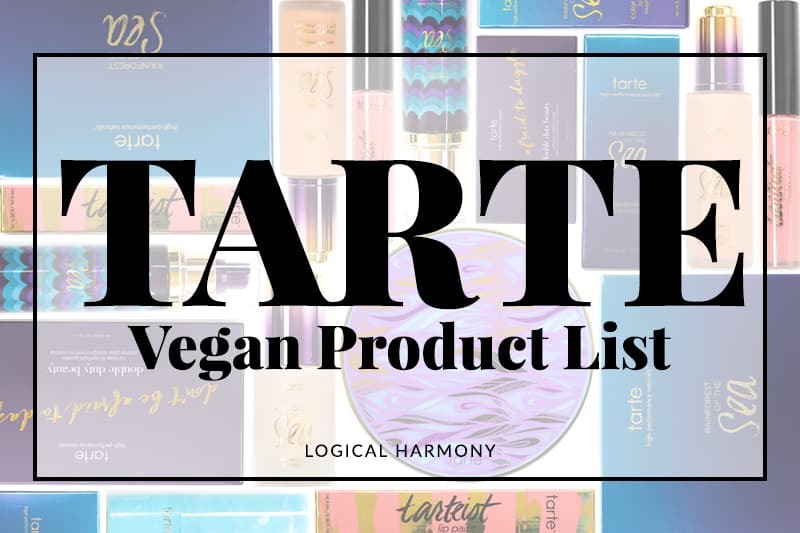 All of their products are both cruelty free and vegan. 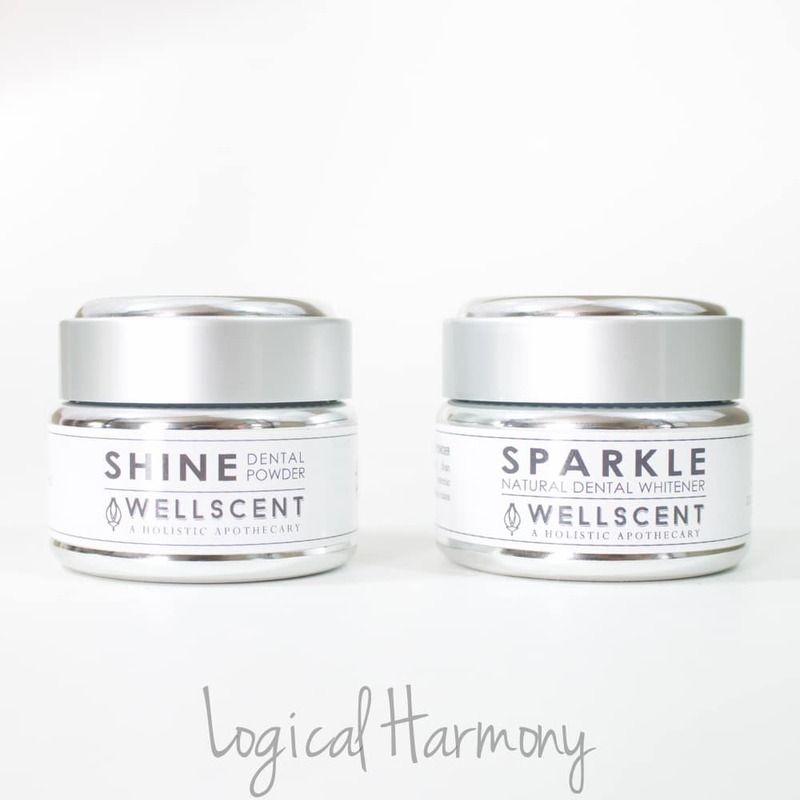 Keep an eye on the Logical Harmony Instagram account for a mini review of Well Scent’s serums, Luminous and Glow. 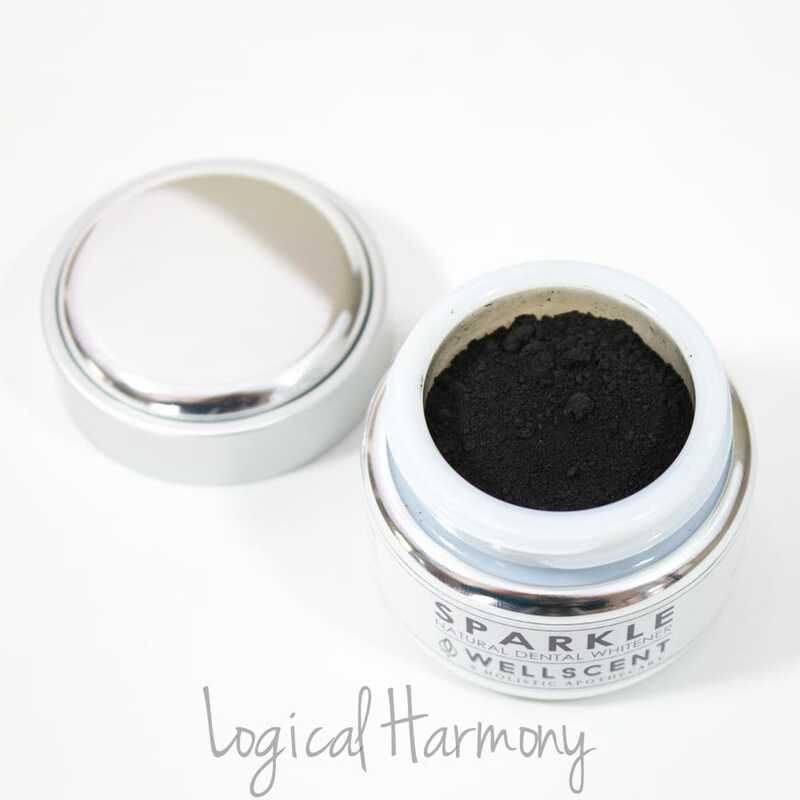 Sparkle Ingredients: Activated coconut charcoal, Sodium Bicarbonate, sea salt, Commiphora Myrrha Oil, Plantago Lanceolata (plantain), Ceanothus americanus extract (Red Root), Azadirachta indica (Neem), Echinacea Angustifolia Leaf Extract. Shine Ingredients: Sodium Bicarbonate, sea salt, *Dimethyl Sulfone (MSM), Mentha Piperita (Peppermint) Oil, *Zinc Oxide, *L-ascorbic acid, bentonite, xylitol. (Peppermint-free option available.) *Excipient free. Watch Your Mouth Ingredients: Cinnamomum Zeylanicum Leaf Oil (Cinnamon), Mentha Piperita Oil (Peppermint), Hippophae rhamnoides (Supercritical sea buckthorn berry oil), Thymus vulgaris extract (Thyme), Eugenia Caryophyllus (Clove) Flower Oil, Pistacia lentiscus gum water (mastic), Azadirachta indica (Neem) and 100% USDA Certified Organic Simmondsia Chinensis (Jojoba) Seed Oil. Editor’s Note: This is a sponsored conversation written by myself on behalf of Well Scent. The opinions and text are all mine. The product(s) featured in this post were provided by a representative of the company named in this post for editorial consideration. Please note that all reviews are 100% honest and a product or service would not receive a favorable review unless it provided favorable results. It’s definitely worth it! Which item are you getting first? This seems interesting and I would absolutely try it, but my goodness is that expensive. Wow! I can understand what you mean, but there are a few things to consider with the price tag. The ingredients are all-natural and really high quality. You only use a pinch per use. I have used Sparkle 15-20 times and Shine at least twice that, and have barely put a dent in the products. There is a LOT of product in the containers. If you break it down to cost per use, they are actually really affordable. And they work! 🙂 Personally, I wouldn’t let the price hold you back here at all. The products are well worth it. SO glad you are sharing this!!! I have been looking for a cruelty free tooth whitener. Can’t wait to try it. Wow these products seem really great! I used to be a dental assistant so I am really interested in dental products. I’ll have to check these out!